Aluminium Dip Brazing | Arvalda Corp | Florida Aluminum Dip Brazing | CNC Machining | Central Florida Sheet Metal FabricationArvalda Corp.
Aluminum dip brazing is a process that offers the designer enormous flexibility. Common applications include wave guides, heat sinks, and electronic chassis which have leak tightness or stringent EMI criteria. The primary advantage of aluminum dip brazing is the ability to join thin and thick sections in one or multiple areas of a part. The aluminum dip brazing process is covered by specification AWS C3.7 and Mil-B-7883. Although the Mil spec is no longer active, it still appears often on older documentation. 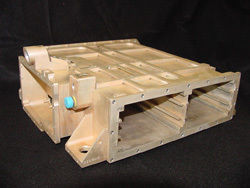 Subcomponents which will comprise the final assembly are produced usually via CNC machining or modern sheet metal fabrication techniques. Card guides and heat sink fins are features often incorporated into the final assembly. Subcomponents are designed with the brazed joints in mind. Slots and tabs are often added to aid in preassembling the part. Sometimes subcomponents can be tack welded or even fastened together with aluminum screws which become part of the structure. The key is to provide a consistent gap between to allow the filler material to flow sufficiently. The part is then assembled, using fixtures which will also hold the part in place as it is brazed. As the part is assembled filler material is added to the joints in very tightly controlled quantities in either a paste or shim form. The filler material is ordinarily around 90% aluminum. The fixtured assembly is then pre heated in a furnace at around 900 degrees. Next the assembly is immersed or dipped in a molten salt furnace where the filler material flows via capillary action into the gaps between the components brazing them together. The part is then removed from the furnace, allowed to cool, and cleaned and age hardened. In some cases, post brazing straightening and machining operations are performed. Usually the best approach to designing a dip brazed part is to think of the final assembly first, then consult with the supplier in terms of details of the joint clearances and subcomponent parts. It is usually best to find a dip braze source with the capability to produce the necessary subcomponent parts and do the brazing in house. Having component parts fabricated in one place and then toll brazed elsewhere can lead to some unpleasant situations should the final result not be what was desired.